So many challenges, so little time. The Sweet or Savory challenge ingredient of the month is blueberries. The raw challenge of the month is ice cream sandwiches. 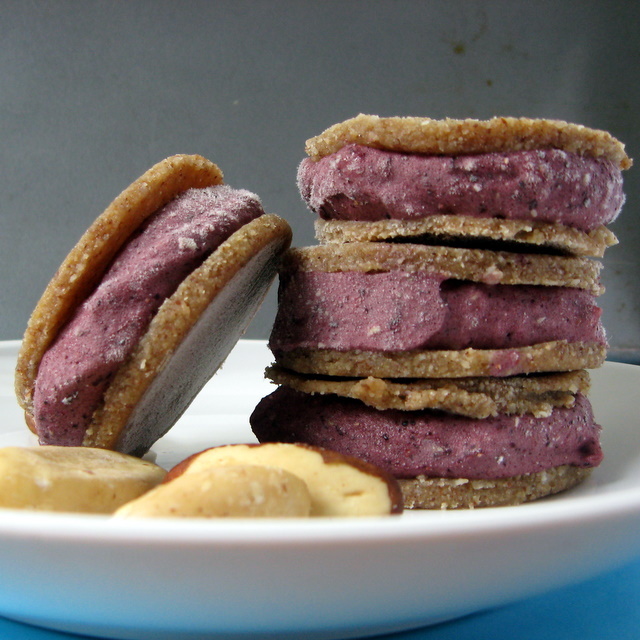 And, so, I multi-task by making raw Brazil nut, banana, blueberry ice cream sandwiches – or Frozen Triple B Bites. In the bowl of a food processor, pulse the Brazil nuts until finely ground. (Stop before they turn into nut butter.) Add the banana and process until creamy. Add the rest of the ingredients and process until you have a thick dough. It will be sticky. Roll out between two sheets of parchment paper. Tip – if your parchment paper is moving on your counter, wet the counter slightly. Cut with a cookie cutter into approximately 10 cookies. (I had some leftovers. I ate them. Raw. Rolled into little balls. It’s the cook’s prerogative to do that, you know.) Dehydrate at 115° until firm but not crisp. I started on a fruit roll tray, and moved them to a mesh screen after about 4 hours. My dehydrator took about 6 hours. Your dehydrator may vary, so check them occasionally. Freeze cookies until ready to assemble. Place a scoop of ice cream on one frozen cookie. Top with another cookie and press down gently until ice cream fills the gaps. Freeze on a cookie sheet until solid. Wrap individually. These are best when you allow them to soften for a few minutes before eating. In case all those challenge posts don’t give you enough ideas, you can also check out Slightly Indulgent Tuesdays (and check out her beautiful brand new site design). This entry was posted in bananas, cookies, desserts, flax seed, nuts and tagged banana, blueberry, frozen, ice cream, raw, recipes, vegan. Bookmark the permalink. Thanks Ricki – I know you can’t do bananas. But, maybe pears would work instead? That looks fantastic, I really do need to invest in a dehydrator. I just can’t picture myself leaving my temperamental oven on for hours at a very low heat. I don’t think you’d leave it on for hours. Most ovens don’t go much lower than 250, or maybe 200. They’d dry out a lot faster at that temp. Maybe an hour? I’m guessing here. But, I don’t think it’d be real long. You could also try adding a couple more tablespoons of coconut flour and just eating them frozen without dehydrating at all. Pingback: Pink Poodles Part II and Raw Blueberry Cake Balls | Sometimes I "Veg"
What a great way to multi-task 🙂 I love the use of all that delicious fruit in your creation. Thank you for participating in the Raw Ice Cream Sandwich Challenge! I just did some multi-tasking myself for a few food events, but not for these particular ones. Now you’re making me think that my latest recipe could work for two of the same events–thanks, Deanna! These ice cream sandwiches look pretty amazing. You rock on multi-tasking and dehydrating for deliciousness, dear! Thanks, Shirley. I’ll have to check out your multi-tasking. I’ve been avoiding the computer a bit this week, except email. So, I’m waaaay behind on my blog reading. I’m sure whatever you made is wonderful, as always! These are beautiful! and they sound very delicious! What a fantastic entry! The ingredient list sounds amazing and the purple colour makes this treat perfect for a special summer soiree! Thanks, Lisa. I might have another entry before the first as well. Ideas churning…. Is coconut flour needed? I wouldn’t want to buy a flour just to use it once. I have soy flour and white, but willing to buy wheat. Do you have unsweetened dried coconut and a coffee grinder? You could probably make your own. But, the amount would be different. I’m not sure if other flours would work or not…. Coconut flour is highly “thirsty” – so with any other flour you would probably need more. Thank you! Looks like you’re new to my blog. I hope you find other things to your liking as well. Brazil Nut Banana Cookies!? Ummm, must make these – sound delish!! This may be the dumbest question ever, but is the blueberry mixture the consistency of ice cream after all the ingredients are blended in the processor, or do you have to put it in the freezer before adding to the cookies? Oops, missed this comment. If your blueberries and bananas are frozen, you don’t have to freeze it first. It will be ice-cream-ish right after making it.